The Stand in the Schoolhouse Door took place at Foster Auditorium at the University of Alabama on June 11, 1963. 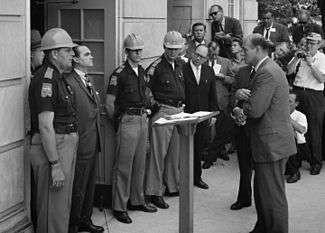 George Wallace, the Democratic Governor of Alabama, in a symbolic attempt to keep his inaugural promise of "segregation now, segregation tomorrow, segregation forever" and stop the desegregation of schools, stood at the door of the auditorium to try to block the entry of two black students, Vivian Malone and James Hood. The incident brought Wallace into the national spotlight. On June 11, Malone and Hood pre-registered in the morning at the Birmingham courthouse. They selected their courses and filled out all their forms there. They arrived at Foster Auditorium to have their course loads reviewed by advisors and pay their fees. They remained in their vehicle as Wallace, attempting to uphold his promise as well as for political show, blocked the entrance to Foster Auditorium with the media watching. Then, flanked by federal marshals, Deputy Attorney General Nicholas Katzenbach told Wallace to step aside. However, Wallace interrupted Katzenbach and gave a speech on states' rights. Katzenbach called President John F. Kennedy, who federalized the Alabama National Guard. Four hours later, Guard General Henry Graham commanded Wallace to step aside, saying, "Sir, it is my sad duty to ask you to step aside under the orders of the President of the United States." Wallace then spoke further, but eventually moved, and Malone and Hood completed their registration. ↑ In February of 1956, Autherine Lucy started classes under guard at UA as a graduate student after having been admitted three years earlier. 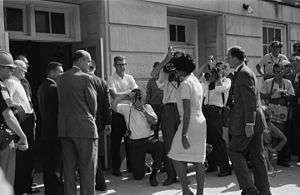 Her presence was met with riots, and the administration found excuses first to suspend, and then expel her shortly after she enrolled. 1 2 Elliot, Debbie. Wallace in the Schoolhouse Door. NPR. June 11, 2003. Accessed February 19, 2009. ↑ Democratic Governor George C. Wallace's School House Door Speech. Accessed February 19, 2009. ↑ "Address on Civil Rights". Miller Center of Public Affairs. June 11, 1963. Retrieved 2013-02-07. This afternoon, following a series of threats and defiant statements, the presence of Alabama National Guardsmen was required on the University of Alabama to carry out the final and unequivocal order of the United States District Court of the Northern District of Alabama. ↑ Andrew Cohen (May 9, 2012). "Nicholas Katzenbach, Unsung Hero of America's Desegregation". Theatlantic.com. ↑ Wallace, George C. (12 December 2012). "Governor George C. Wallace's School House Door Speech". Alabama Department of Archives and History. Montgomery, Alabama. Archived from the original on 6 August 2002. Retrieved 14 April 2016. ↑ Lesher, Stephan (1995). George Wallace: American Populist. Da Capo Press. p. 233. ISBN 9780201407983. ↑ Byers, Thomas (1996). "History Re-Membered: Forrest Gump, Postfeminist Masculinity, and the Burial of the Counterculture". Modern Fiction Studies. 42 (2): 419–44. doi:10.1353/mfs.1995.0102. Retrieved 2009-02-28. ↑ Paul Grainge (2003). Memory and Popular Film. Manchester University Press. p. 229. ISBN 978-0-7190-6375-6. Retrieved February 28, 2009. ↑ Grayson, Wayne (8 June 2012). "Son says former Gov. George Wallace repented for past". The Tuscaloosa News. Retrieved 15 January 2016.